This is a bit of a surprise! There is a listing of a new condition open-back Grado SR60i headphones offered for the very specific price of $35.50 with a “1-3 months” shipment estimate. These are sold and shipped by Amazon actual. The only strange thing about this listing is that the manufacturer name in one of the Amazon fields has been changed from “Grado” to “ANCHENLE” (whatever that is). PS: the SR60i [which I had] is the previous generation model. The current generation is the SR60e. And before those two there was the SR60. I personally did not find the SR60i as polarizing as some of the forum dwellers, but it definitely had a bit of a unique sound signature. This is a higher risk purchase, so keep that in mind. A couple of “fulfilled by Amazon” marketplace sellers are offering the Grado iGe in-ears with the iOS buttons/mic for $37.50 with free shipping. The price by Amazon and Grado’s own store is $99. The new condition Grado SR325e Prestige series open-back headphones go for $295 but if you want to save some, you can get them for $251~ in “Used – Like New” (damaged original packaging) by Amazon Warehouse Deals (AWD) actual. This may suggest the “pizza box” they come in is dinged up, but keep in mind, every single AWD listing is an individual thing, so it can always be in better or worse condition than as described laconically in the listings. No one is going to complain if it’s in better condition, but there is also the risk it might be worse than described. That’s one of the reasons why they offer a 30-day return policy. As of the time of writing, there is one unit available of the open-back Grado SR80e in “Used – Very Good” condition (minor cosmetic imperfections, damaged original packaging) for $79~ with free shipping by Amazon Warehouse Deals actual. As of the time of writing there is one unit left of the open-back Grado SR60e in “Used – Like New” condition (damaged original packaging) for $67~ with free shipping by Amazon Warehouse Deals actual (not iffy marketplace sellers). The new condition price is $79. The latest generation is the Grado RS2e, part of their Reference Series (thus the “RS”) going for $495 in new condition at authorized dealers. But if you prefer the previous generation, the RS2i, this model is available in new condition for $469 by Amazon actual. This is more of an availability alert than a deal alert. Holiday shoppers are typically scooping up used Grados from Amazon more aggressively than during the “regular season”, but we finally spotted one available! It is the Grado Reference Series RS1e in “Used – Very Good” condition (cosmetic imperfections; damaged original packaging) for $556 with free shipping by Amazon Warehouse Deals actual. The new condition price is $700 at authorized Grado dealers. PS: especially with Grados, beware of any urecognizable sellers offering them at Amazon/Warehouse, especially if the prices are too good to be true. The open-back Grado SR-225e headphones go for $200 in new condition at authorized dealers, but if you are comfortable with used, you can get them in “Used – Good” (repackaged) condition for $150 by Amazon Warehouse Deals actual. Of other Grados, only if you are a high-risk tolerance shopper, one fulfilled by Amazon 3rd-party seller has the Grado iGe in-ears with Apple controls for $55 instead of their usual price of $99. You have extra protection because it is “fulfilled by Amazon”, but still, you have to worry about these being authentic or something else wrong with them. This is more of a PSA to avoid, than a deal alert. But of course I am not the master of the universe, different people have different risk tolerances. The Grado patrol on Amazon has the following used options available at the moment. I’m only listing the ones where Amazon Warehouse Deals actual is the seller. If anyone else is the seller (other than the official Grado store) make sure you double check and triple check to make sure they are legit sellers! The new condition open-back Grado SR225e headphones go for $200 at authorized dealers, but if you prefer to save with used, they go for $170 in “Used – Like New” condition (original packaging) with free shipping by Amazon Warehouse Deals actual. The new condition open-back Grado Professional Series PS500e go for $600 in new condition at authorized dealers, but if you want to save with used, they are available in “Used – Good” condition (cosmetic imperfections, missing manual, repackaged) for $366~ with free shipping by Amazon Warehouse Deals actual where they average 4.5 out of 5 based on 32 customer reviews. Flagship mania 2017 continues! The new Grado PS2000e flagship headphones are now in-stock and ready to ship to your ears for $2695 with free expedited shipping at B&H Photo. B&H is an authorized dealer and on top of that, they are not that far away from where Grado makes their headphones. So the headphones won’t have to “travel” far to get to their store. New York squared! And now we continue “digesting” the USED headphones that were earmarked during yesterday’s Amazon Warehouse Deals session with some Grado action. The open-back Grado SR325e go for $300 in new condition at authorized dealers, but if you want to save some, and you don’t need the user manual or the original pizza box packaging, you can get them in “Used – Good” condition for $239~ by Amazon Warehouse Deals actual. There’s only one listing for this model. On the other hand, there are multiple used listings for the Grado SR225e which goes for $200 in new condition, but $167~ in “Used – Good” condition. There’s a total of four used listings, so if they don’t move fast enough for Amazon’s price-bots’ liking, their prices may drop further. If you are interested in getting the Grado SR-225e used, and have some patience (eg, you don’t need them yesterday), there are multiple listings of them in “Used – Good” condition for $162 at Amazon Warehouse Deals. If supply wins over demand, the Amazon price bots may discount them in the future. This is of course only a guess, as no one (probably not even Amazon employees) can guess for sure since Amazon is very data-driven and (their software/bots) make multiple on-the-fly adjustments. The headphones themselves average 4.3 out of 5 based on 100+ customer reviews. There are many philosophies on what the entry-point into Grado might be for one. Some suggest the low risk approach of the SR80/SR60, others the SR125, and yet others the SR225. If you want a curiosity-entry into the Grado sound, their SR60e open-back on-ear is available in “Used – Good” condition (no details given) for $59~ with free shipping by Amazon Warehouse Deals. The new condition price at authorized dealers is $79. They arrive in a pizza-style box (unless they changed their packaging). The entry-point into the Grado sound is the SR60e, and it goes for $79 in new condition at authorized dealers, but if you want to try out the “Grado Wall of Sound” for less, this is available in “Used – Good” condition for $59 by Amazon Warehouse Deals actual. As of 4/10/17 PM, this sold out: On the other hand, if you want to jump in a couple of steps above that in the line-up, the SR125 goes for $150 in new condition, but you can get it in “Used – Good” for $112.50 by Amazon Warehouse Deals. The open-bcak Grado SR80e go for $100 in new condition, but if you are comfortable with used, you can get them in “Used – Very Good” condition (minor cosmetic imperfections; original packaging) for $79~ by Amazon Warehouse Deals. This is perhaps the best entry-point value-wise into the Grado sound signature. The new condition open-back Grado SR80e go for $100 in new condition at authorized dealers, but if you want to save some, you can get it in “Used – Very Good” condition for $79~ or “Used – Like New” for $85~ with free shipping from Amazon Warehouse Deals actual, so you get Prime benefits if a member. The open-back on-ear Grado SR80e go for $100 in new condition at authorized dealers, but if you prefer used, these are as good of a bang-for-the-buck entry into the Grado line-up, going for $74~ in “Used – Good” condition (cosmetic imperfections, damaged original pizza box packaging) by Amazon Warehouse Deals actual. As of 12/3/16 recheck, this sold out in used condition… We continue our Amazon price-checking adventures with arguably the bang for the buck entry into the Grado line-up, the open-back on-ear SR80e, available in “Used – Good” condition for $74~ by Amazon Warehouse Deals, instead of the new condition price of $100 at authorized dealers. The open-back Grado SR80e are described by many as a good entry into the Grado line-up without risking too much money on them. They go for $100 in new condition at authorized dealers, but if you are comfortable with used, you can get them in “Used – Very Good” condition (cosmetic imperfection, damaged original pizza box) for $77~ by Amazon Warehouse Deals actual. The new condition Grado SR125e open-back headphones go for $150 at authorized Grado dealers, but if you want to save some,they are currently available in “Used – Very Good” condition for $104 with free shipping by Amazon Warehouse Deals. Grados go in and out of Amazon Warehouse Deals as people buy/sell/trade return them through Amazon. At the moment the open-back on-ear Used SR80e (“Used – Good”) goes for $74~ through Amazon Warehouse Deals (AWD) actual (not marketplace sellers), while the Used SR125e (“Used – Very Good” goes for $120 by AWD actual. 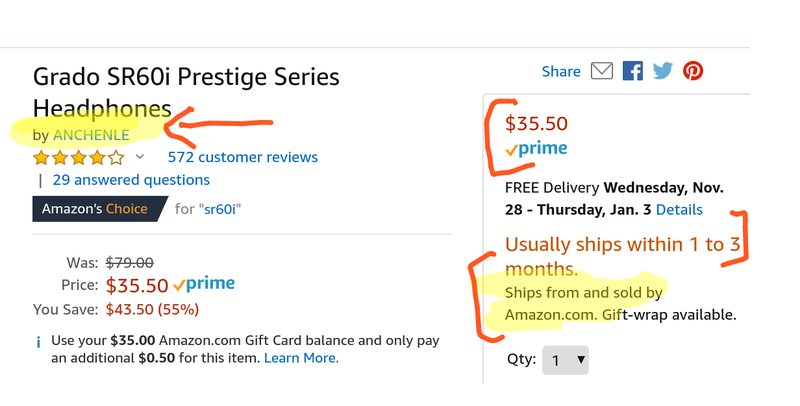 There’s also a listing by a seller with just 1 rating that ends up the same price after shipping but it’s not Prime eligible. PS: the new condition prices at authorized dealers for these two are $100 and $150 respectively. PS: if you are not familiar with the Grado naming scheme, the “i” and “e” in their names have nothing to do with iPads or remote/mics or digital features. It’s just a naming convention. They are wired plain headphones.